I know, I know. I’ve totally lost it, but it’s not my fault. Josh at the Grant Family Farms CSA keeps plying me with kale. What’s a girl to do when her touch and glide crisper drawer is filled to the brim with bunches of dark green leafy things? Simply shutting the drawer has become an effort in futility. I’ve dehydrated, sautéed, and steamed my way through plenty of hearty greens lately, so I thought it was time to try something new. Chips. Healthy chips. And what packs more nutritional punch than kale? Seriously, kale is over-the-top with healthy vitamins and minerals. But before I launch into all that, did you know that LAY’S brand is America’s favorite snack food? Well, the website states that the country’s most popular potato chip is now more irresistible than ever before! Oh, great, just what we need. More moderately addicting, hard-to-resist, nutritionally-void, artificially flavored, calorie-laden snack food. And get this, the website lists 57 different flavors of potato chips! Fifty-seven? What’s that about? They offer everything from LAY’S Loaded Potato Skins Flavored Potato Chips to LAY’S Crab Spice Flavored Potato Chips. Ugh — crab spice? And what the heck are loaded potato skins flavored potato chips? What does that even mean? I looked up the nutritional facts and ingredient list on the loaded version and found it difficult to sift through. Included in the long list of ingredients were 5 different artificial colorings. That’s not real food. Do we really need to feed our kids yellow 6 lake, yellow 5, red 40, yellow 6, or blue 1? Here’s a healthy alternative and you can rest assured that kale does not contain gluten, which is always a concern with prepackaged foods containing hard-to-decipher ingredient lists. • Preheat oven to 350 degrees. Place rack in middle of oven. • Toss kale with olive oil and spread out on large cookie sheet. • Sprinkle with sea salt or spices. • Bake in oven for 7-8 minutes. Stir once and bake for 5-7 more minutes. • Enjoy immediately. These do not save well. The charming butcher at my local Whole Foods gave me some of his super-secret sassy rub that I used as the spice for my version of kale chips. Unfortunately, he wouldn’t tell me what was in the mix and I didn’t have a sassy decoder ring to figure it out. After thoughtfully sniffing, tasting, and playing with the stuff, I decided it contained red chile pepper flakes, sesame seeds, ground pepper, garlic salt, and sea salt. 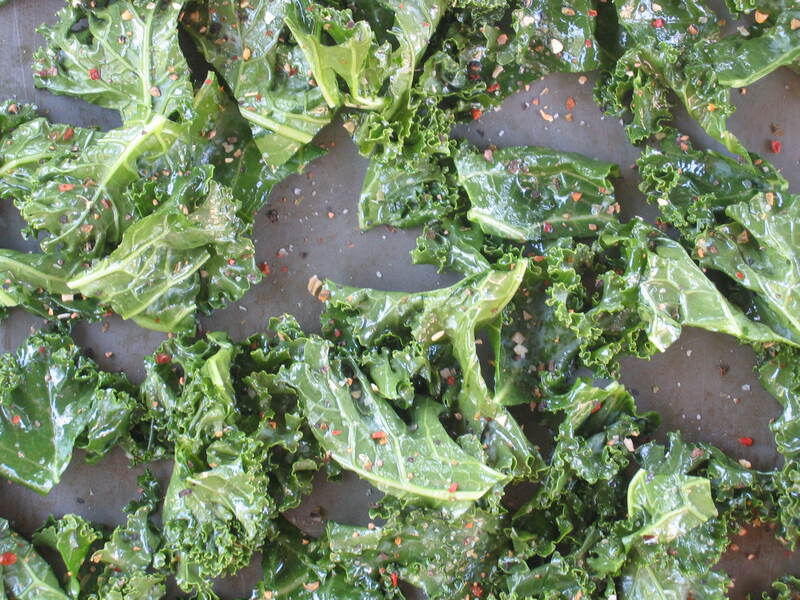 I tossed my prepared kale in olive oil, spread it out on a baking sheet, sprinkled the sassy rub on it, and baked it. YUM! Be careful though, these chips are hard to resist and border on being addicting! Kale is part of the cruciferous family and is a descendent of the wild cabbage. Cruciferous veggies and their sulfur-containing phytonutrients are thought to be protective against cancer. Kale also contains high amounts of the eye-protective carotenoids, lutein and zeaxanthin. These substances help the eyes filter out damaging ultraviolet light and provide protection against cataracts. Think of kale as a plant version of polarized sunglasses. Full of anitoxidants, kale also helps boost immune function and protects our cells against oxidative damage. One cup of kale contains only 36 calories and is an excellent source of vitamins K, A, C, manganese, fiber, — even calcium, so throw some in your shopping cart and enjoy the benefits. *Kale contains goitrogens and oxalates, which may be of concern to some people. Goitrogens are natural substances that, in large amounts, may interfere with thyroid function. Oxalates are part of a naturally occurring group of molecules called organic acids and are found in plants and animals (people included). Our bodies convert other substances into oxalates. We also obtain them from the foods we eat. In some rare health conditions, oxalate intake should be restricted. Check with your doctor if you have concerns about this. P.S. I will be heading off into the wild blue yonder to add some more segments to my Colorado Trail journey, so if I don’t respond to comments immediately, I will when I return. Onward . . . This entry was posted on Thursday, July 24th, 2008 at 6:44 am	and is filed under Celiac & Gluten Intolerance, Gluten-Free Recipes, Nutrition Therapy, Super Foods. You can follow any responses to this entry through the RSS 2.0 feed. You can leave a response, or trackback from your own site. Yum Yum! I love kale chips!! I make them in the winter (the oven is too hot to use in the summer) or nowadays in our dehydrator. They are my staple for “chips”- I never liked potato chips anyways. Some veggie chips with string beans and sweet potatoes are nice in the fall though. Cindy — it’s so nice to have you back! The wedding photos are lovely! And I knew I’d get a response from you with this kale post. You’re definitely the kale girl! The kale looks amazing. Pity it doesn’t store well as a light weight snack for the next leg of your journey. AOF — actually, I’ve dehydrated two or three bunches of kale and it makes for great backpacking food. It weighs nothing and can be added to dried soups for extra nutritional punch. I just picked up two more bunches (along with a basket of other assorted veggies) from my CSA. Geez, I’ve got this stuff coming out my ears! That’s a new one on me, I love Kale, it has to be one of my favourite vegetables. I like to use it in risottos/pasta and Italian soups or, best of all just cooked with lemon juice, butter and a pinch of caraway or cumin seed with a touch of dried chilli. You’ve made me hunger for the start of the English game season! Thanks for the invaluable insight into its nutritional value, I didn’t know that. Melissa, your trip sounds so fun! I hate to add more to your ‘to do’ list…but I’ve tagged you for a meme when you get back I tried kale chips like this and they don’t do so well in our humidity…I think they lasted about 30 minutes before deflating into a soggy pile – but before that, they were certainly delcious! Hey Miles — nice to “see” you over on our side of the country. As I’ve been working on a “cilantro” post, I keep thinking of musical add ons — mainly because I enjoy your music references so much. Nice mix of food and music! Hey everyone, check out Miles’ blog. Hi Tiffany — thanks! We’re having a great time in between lots of miles, lots of elevation, lots of bug bites, and our share of rain! No complaining though. Oh Michelle — bummer about the soggy chips. Yeah, I never thought of that, but I guess you need to be high and dry to make these things. I’ll check out your meme tag. Love the new look of your blog, by the way. It’s great! One of my favorite vegetables is kale and this looks good. I often steam a bowl for dinner with just a little salt & pepper. Have fun in the wild. Kale chips, eh? I’ll have to try those, although my family will revolt if I try to replace basic potato or tortilla chips with those! I had to catch up on your posts. Really neat stuff! Glad to hear you’re doing what you love. Thanks for the ‘big up’! Funny you should mention cilantro, I keep writing coriander and forget that most of my blog’s readers are American-does anyone say coriander? Kim – thanks, I’m heading out into the wild blue yonder again tomorrow. We’ll be out at least a week this time. Yes, plain old steamed kale with sea salt and ground pepper is hard to beat! Jo – yeah, I know. Kale chips over salty old potato chips? Your kids might not “take” to it at first. Or ever. Hope all is well with you! Miles – there’s no way I can keep up with you and all your posts! People here call the spice coriander and the leaves cilantro. I imagine most people think they are two different plants. Jen – this recipe has worked for me, but some of my friends say the “chips” come out too sloppy and not crispy enough. Be careful not to put too much olive oil on them. Plus, if it’s humid where you are, they will wilt fast. Eat them quickly! Take care everyone. I’ll be back in a week or so. Thanks for the great post…I must try these! How long do they take to dry in the dehydrator, and what temp do you use? If you are still out on the trail, hope you are having a splendid hike today! Just tried your Kale chips – I love them! Barney…not so much! Your site is great – I will try to visit more often. Hope all is well with you and the family. I’ve been wanting to try these,but the kale at my local grocery always looks half dead so I had to wait. I found myself at the Union Sq. green market, remembered, and picked up some beautiful organic kale. I just made these tonight, mostly because I was skeptical. Of course I’d love a crunchy snack,but plain kale makes me gag. Anyhoo…THEY ARE TASTY! Sprinkled mine with olive oil,salt, and garlic powder. Yum! Can you make these with spinach? I live in Israel–no kale here.